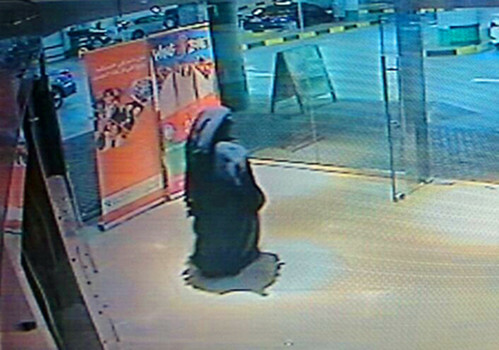 On December 1, 2014, American mother of two was brutally stabbed to death by a burqa-clad woman in the public restroom of a shopping mall on Reem Island in the United Arab Emirates capital, Abu Dhabi. The victim is a 37-year-old kindergarten teacher from the United States, who is the mother of 11-year-old twins. She was taken to Sheikh Khalifa Medical City to be treated for her injuries, but did not survive. The victim’s children are currently in the care of community police, awaiting the arrival of their father from overseas. The father is the ex-husband of the deceased. The slain woman’s initials are known as “ABR” and name is yet to be released by the officials. Investigators are attempting to determine the identity of the attacker, who was wearing an abaya, black gloves and face cover (niqab) at the time of the assault. Her motives are unknown at this time. The suspect fled the scene immediately after committing the crime. Abu Dhabi police have released footage of the assailant leaving the mall, but identification will clearly be problematic, since the woman was covered up head to toe. The murder weapon was found and confiscated by the police. The Ministry of Interior of the United Arab Emirates urged the public to contact them with any information pertaining to this deadly attack.